Angelos Sofocleous in Editor's Picks Philosophy & Religion on 24 November, 2017. Few areas of the art world have received as much criticism as the area of contemporary art. Contemporary art has been perceived by many as a scam, which uses, or misuses, as they say, different notions of the artistic discipline (poetic statements, vague allegories, and different philosophies of life) in a way which is considered to be an insult to the art pieces of Michelangelo, da Vinci, Raphael, and other great artists of the Renaissance. The critic is not ready to accept that contemporary paintings and sculptures can be considered as art, in the same way as masterpieces of the aforementioned artists do. The critic is, indeed, right. Art, however, does not encompass one single discipline whose criteria need to be fulfilled by all artistic pieces in order to be called art. The way artists express themselves has changed substantially from the age of Renaissance to today. It is, therefore, unfair to judge and criticize pieces of art which come from different eras equally, as the rules of the game have changed. What I want to argue here is that contemporary art does have its place in the modern world. The viewer, however, needs to adapt to the rules that apply to contemporary art. The viewer, in fact, plays a considerable role in allowing pieces of contemporary art to express themselves and for the message of the artist to be received and influence the outer world. One of the changes that took place from the art movement in the Renaissance to the movement of contemporary art, is that the involvement of the viewer in the piece of art is much greater. What distinguishes this painting from many pieces of contemporary art is that it can be given an artistic value mostly on its own right. What this means is that art is included in the piece. Any viewer can value this painting without doing much research about the background of this painting and what it tries to convey. 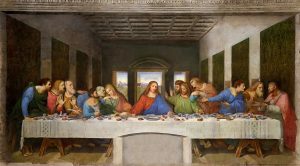 However, an important point to make is that, when the viewer starts to look at the background of the painting, the life of the artist, the biblical story of the Last Supper, and the various messages that da Vinci tried to convey through this painting, it is evident that the painting will gain significantly more value for the viewer. That said, despite the fact that this is a painting that can be given value on its own right, with the values which can be seen at the painting itself, the painting gains significantly more importance and value when the viewer aids themselves in understanding the painting. There are, however, pieces of art in later times in which most, if not all, art is included inside the piece. 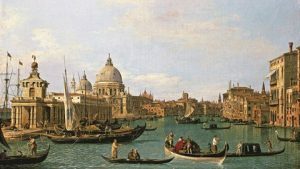 Take, for example, one of Canaletto’s paintings of Venice. His paintings are stunning and incredibly detailed when viewed in real life, but it is arguable whether there is art that is located outside this piece. The viewer does not need to do significant research in order to enjoy the piece – they just need to look at it. This is exactly what has been lost or not carried with pieces of contemporary art. As the art movement progressed from the Renaissance, to the Romantic painters, to now, the viewers did not follow this progress and stayed stationary, expecting to find art solely inside the painting. During the 20th century, the art movement experienced a great revolution, which had taken art outside the piece and made it impossible, at some points, for the viewer to enjoy the piece in itself. What has happened is that, artists have achieved to engage the viewer in the creation process, by encouraging them to look beyond what is presented to them, and also see art in everyday objects. Take, for example, Picasso’s Guernica. Picasso, one of the proponents of the surrealist movement, managed to ‘code’ reality and present it in a different way to the viewer; in a way in which the value and meaning of the painting could only be ‘decoded’ with the aid of the viewer. It is arguable whether Picasso’s Guernica can be valued on its own right. Differently from the paintings of da Vinci and Canaletto, it is disputed whether Guernica is a beautiful piece, in terms of aesthetic beauty. In fact, it was the aim of Picasso that Guernica should not be aesthetically beautiful; it presents the horror of war and the great pain and suffering that it induces. It is, however, artistically beautiful, a beauty which the viewer is only able to see when they manage to go beyond what the piece presents, decode the different meanings that it tries to convey, explore the history behind the painting, and learn about the motivation of the artist, in order to be able to enjoy the painting. 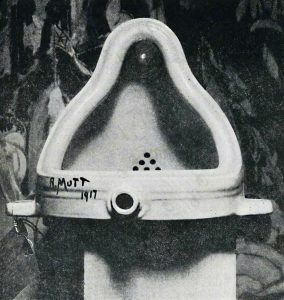 Earlier pieces of the 20 century, like Duchamp’s Fountain are a great and revolutionary example of pieces whose art is mostly outside the piece. There is nothing artistic about a urinal per se. Urinals are not a piece of art. However, this does not mean that they cannot be turned into pieces of art. 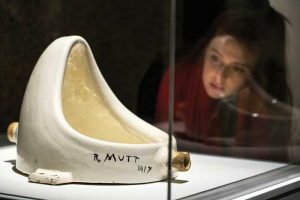 This is what exactly Duchamp managed to show with this concept of the ‘readymade’: Everyday objects in the world are ready for us to use, and can be made to express what the artist wanted, in this case, to be provocative. The artwork is not a special object—it was mass-produced in a factory. The experience of art is not exciting and ennobling—at best it is puzzling and mostly leaves one with a sense of distaste. But over and above that, Duchamp did not select just any ready-made object to display. In selecting the urinal, his message was clear: Art is something you piss on. The viewer of the Fountain, and any piece of contemporary art, needs to try hard and engage themselves with the artist, the history of the piece, the intention of the artist, and the messages the artists want to pass, in order to be able to enjoy a piece. In conclusion, in modern and contemporary art, the viewer should not expect to be passive, the viewer should not expect to be merely a receiver of art, but should become the artist themselves and engage with the artist in the creation and interpretation of the piece.